JOHN GAY (1685-1732), English poet, was baptized on the 16th of September 1685 at Barnstaple, where his family had long been settled. He was educated at the grammar school of the town under Robert Luck, who had published some Latin and English poems. On leaving school he was apprenticed to a silk mercer in London, but being weary, according to Dr Johnson, "of either the restraint or the servility of his occupation," he soon returned to Barnstaple, where he spent some time with his uncle, the Rev. John Hanmer, the Nonconformist minister of the town. He then returned to London, and though no details are available for his biography until the publication of Wine in 1708, the account he gives in Rural Sports (1713), of years wasted in attending on courtiers who were profuse in promises never kept, may account for his occupations. Among his early literary friends were Aaron Hill and Eustace Budgell. In The Present State of Wit (1711) Gay attempted to give an account of "all our periodical papers, whether monthly, weekly or diurnal." He especially praised the Taller and the Spectator, and Swift, who knew nothing of the authorship of the pamphlet, suspected it to be inspired by Steele and Addison. To Liutot's Miscellany (1712) Gay contributed "An Epistle to Bernard Lintot," containing some lines in praise of Pope, and a version of the story of Arachne from the sixth book of the Metamorphoses of Ovid. In the same year he was received into the household of the duchess of Monmouth as secretary, a connexion which was, however, broken before June 1714. The dedication of his Rural Sports (1713) to Pope was the beginning of a lasting friendship. Gay could have no pretensions to rivalry with Pope, who seems never to have tired of helping his friend. In 1713 he produced a comedy, The Wife of Bath, which was acted only three nights, and The Fan, one of his least successful poems; and in 1714 The Shepherd's Week, a series of six pastorals drawn from English rustic life. Pope had urged him to undertake this last task in order to ridicule the Arcadian pastorals of Ambrose Philips, who had been praised by the Guardian, to the neglect of Pope's claims as the first pastoral writer of the age and the true English Theocritus. Gay's pastorals completely achieved this object, but his ludicrous pictures of the English swains and their loves were found to be abundantly entertaining on their own account. Gay had just been appointed secretary to the British ambassador to the court of Hanover through the influence of Jonathan Swift, when the death of Queen Anne three months later put an end to all his hopes of official employment. In 1715, probably with some help from Pope, he produced What d'ye call it? a dramatic skit on contemporary tragedy, with special reference to Otway's Venice Preserved. It left the public so ignorant of its real meaning that Lewis Theobald and Benjamin Griffin (1680-1740) published a Complete Key to what d'ye call it by way of explanation. In 1716 appeared his Trivia, or the Art of Walking the Streets of London, a poem in three books, for which he acknowledged having received several hints from Swift. It contains graphic and humorous descriptions of the London of that period. In January 1717 he produced the comedy of Three Hours after Marriage, which was grossly indecent without being amusing, and was a complete failure. There is no doubt that in this piece he had assistance from Pope and Arbuthnot, but they were glad enough to have it assumed that Gay was the sole author. 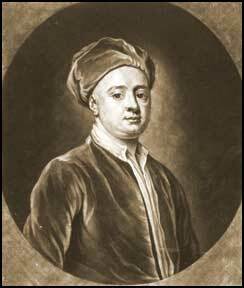 Gay had numerous patrons, and in 1720 he published Poems on Several Occasions by subscription, realizing 1000 or more. In that year James Craggs, the secretary of state, presented him with some South Sea stock. Gay, disregarding the prudent advice of Pope and other of his friends, invested his all in South Sea stock, and, holding on to the end, he lost everything. The shock is said to have made him dangerously ill. As a matter of fact Gay had always been a spoilt child, who expected everything to be done for him. His friends did not fail him at this juncture. He had patrons in William Pulteney, afterwards earl of Bath, in the third earl of Burlington, who constantly entertained him at Chiswick or at Burlington House, and in the third earl of Queensberry. He was a frequent visitor with Pope, and received unvarying kindness from Congreve and Arbuthnot. In 1724 he produced a tragedy called The Captives. In 1727 he wrote for Prince William, afterwards duke of Cumberland, his famous Fifty-one Fables in Verse, for which he naturally hoped to gain some preferment, although he has much to say in them of the servility of courtiers and the vanity of court honours. He was offered the situation of gentleman-usher to the Princess Louisa, who was still a child. He refused this offer, which all his friends seem to have regarded, for no very obvious reason, as an indignity. As the Fables were written for the amusement of one royal child, there would appear to have been a measure of reason in giving him a sinecure in the service of another. His friends thought him unjustly neglected by the court, but he had already received (1722) a sinecure as lottery commissioner with a salary of £150 a year, and from 1722 to 1729 he had lodgings in the palace at Whitehall. He had never rendered any special services to the court. He certainly did nothing to conciliate the favour of the government by his next production, the Beggars' Opera, a lyrical drama produced on the 29th of January 1728 by Rich, in which Sir Robert Walpole was caricatured. This famous piece, which was said to have made "Rich gay and Gay rich," was an innovation in many respects, and for a time it drove Italian opera off the English stage. Under cover of the thieves and highwaymen who figured in it was disguised a satire on society, for Gay made it plain that in describing the moral code of his characters he had in mind the corruptions of the governing class. Part of the success of the Beggars' Opera may have been due to the acting of Lavinia Fenton, afterwards duchess of Bolton, in the part of Polly Peachum. The play ran for sixty-two nights, though the representations, four of which were "benefits" of the author, were not, as has sometimes been stated, consecutive. Swift is said to have suggested the subject, and Pope and Arbuthnot were constantly consulted while the work was in progress, but Gay must be regarded as the sole author. He wrote a sequel, Polly, the representation of which was forbidden by the lord chamberlain, no doubt through the influence of Walpole. This act of "oppression" caused no loss to Gay. It proved an excellent advertisement for Polly, which was published by subscription in 1729, and brought its author more than £1000. The duchess of Queensberry was dismissed from court for enlisting subscribers in the palace. The duke of Queensberry gave him a home, and the duchess continued her affectionate patronage until Gay's death, which took place on the 4th of December 1732. He was buried in Westminster Abbey. The epitaph on his tomb is by Pope, and is followed by Gay's own mocking couplet: "Life is a jest, and all things show it, I thought so once, and now I know it." Adis and Galatea, an English pastoral opera, the music of which was written by Handel, was produced at the Haymarket in 1732. The profits of his posthumous opera of Achilles (1733), and a new volume of Fables (1738) went to his two sisters, who inherited from him a fortune of £6000. He left two other pieces, The Distressed Wife (1743), a comedy, and The Rehearsal at Goatham (1754), a farce. The Fables, slight as they may appear, cost him more labour than any of his other works. The narratives are in nearly every case original, and are told in clear and lively verse. The moral which rounds off each little story is never strained. They are masterpieces in their kind, and the very numerous editions of them prove their popularity. Encyclopedia Britannica, 11th Ed., Vol. VII. Cambridge: Cambridge University Press, 1910. 541.